The world today changes before us more quickly than one could have imagined. Those things we once took for granted can no longer be expected, and so many of us are fighting to hold on to values and standards which seem to be fading all too rapidly. The problems facing the music educator today are often gigantic and frequently beyond his or her control. All too many want to give up. Kids today face issues and decisions beyond anything we would have dreamed even 10 years ago, and the school funding pressure in the arts are certainly not helping anyone. The general tenor in the world is almost that of “survival” and amidst all of that, we are facing the elimination of our arts programs in many areas. ALL THE MORE REASON FOR US TO HOLD ON TO THE MARCHING BAND and all the value it offers our students. It is way to easy for people who don’t understand to negate the value of the Marching Band and this cannot be allowed to happen. 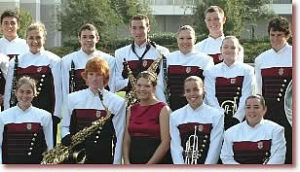 There is a unique and exciting aspect to marching band which young people seldom find available to them elsewhere. Each performance is a special opportunity where students experience a sense of community and realize that the sum of who they are is far greater than any one individual. They have a sense of esteem through unity and expression and understand more than ever the importance of working in tandem with other people. Without it ever being on the curriculum, our young artists are learning how to be team players, how to fit into a community and how to do their fair share. And this may be the greatest lesson of all. The nurturing of the growing performers becomes a high priority as they learn about challenges and standards and discover that the achievement of excellence is a process, not an event. Marching Band provides a “society” and “family” to which all band students can belong. It is a place where they learn values and standards, where they can learn to depend on one another in their pursuit of their excellence. They learn about responsibility, doing their fair share, and sticking to a common goal. They learn to value people, respect their peers and not make judgments on the superficial. They frequently acquire a stronger base for their adult life than any other avenue open to them. The thrill of performance, applause and recognition is all too infrequent for many of today’s youngsters. Without the marching band experience many would never know this joy. There are few opportunities for a young person to learn to be imaginative and creative—qualities that tare infinitely important if one is to deal with society today. Few other places teach a young person to measure his or her self worth on standards all too often lost in today’s world. Few educators today have the opportunity to reach students to the degree the band director can. You deal with artistic, mathematical, athletic, social, psychological, leadership development of countless boys and girls. You develop the students’ self-esteem in areas not measured through academic testing, reaching those students whose talents lie beyond the linguistic or the mathematical. You create a “place” for some that would never otherwise know the security offered in a group endeavor. You put in more hours and receive less financial award than any other educator, but few can compare to the “spiritual” reward when you amass that list of successes your students will experience through your singular efforts. 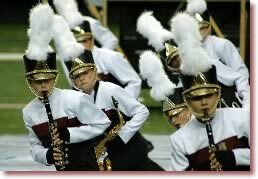 The marching band is the prime visible evidence and marketing device for music education. Only through half-time shows, parades and competitions could you reach the community and let them experience the values of what you bring to their children. Only the marching band stirs memories of the better times when fraternalism sparked our society and a more carefree atmosphere prevailed. The marching band is today, as it has always been, a celebration of joyful efforts—it holds a promise of healthy and enthusiastic youngsters, and the marching Band Director an booster parents can make all of this happen. Never doubt the importance of this opportunity. Everything in life worth doing takes gigantic commitment and effort. There is no question that you will be putting forth that kind of energy; there is also no question that the rewards yielded from stronger, more secure, open minded, and committed students will make all the efforts worthwhile. They will give you the energy and motivation just as you will show them the standards and rewards. Marching band and Music Education is a privilege and a trust of great magnitude. Time and time again, we find that band students are more successful in college, have a stronger work ethic, higher standards and more secure values. Through competitions (if you choose that avenue) they become acquainted with qualities which will serve them well in business and the adult world. They will have the security that they know how to extend their own efforts beyond what the average young adult may set as a limit. There is a point in a young person’s life when most don’t know themselves or their potential and frankly they don’t know how to discover their potential. Many are so caught up in the social and peer problems of life that they don’t think of potential beyond that area. Marching band encourages each student to discover his or her personal weaknesses or strengths. It helps the student overcome weakness. Its unusual structure (removal from the classroom to the athletic field) allows for a whole new set of values to be introduced. Portrayal of many roles throughout the drama of the program permits the student to explore a variety of concepts removing him or her from social images based on beauty, athletic skills or popularity success. Here the reward is given to student who makes the commitment, does his or her small job within the “community” of the band and the reward and recognition is given for diligence and effort and the skills that ultimately bring the entire program message to the public view. They learn to trust and respect themselves and they learn to trust and respect others based on an entirely different set of values than the average teenager today experiences. They realize the reward of team effort and the importance each individual plays in making up the team. In some cases it becomes the social arena some youngsters seek but do not find in ordinary circumstances. We must not judge a child ONLY on achievements in the two most emphasized academic efforts (verbal and mathematical/logical). Kids make their mark in life by doing what they CAN do, not what they can’t. School is important. It opens doors of awareness never before considered. LIFE is MOST important. Being happy is using your skills productively, no matter what they are. A well taught, well planned marching band program with all of its connection groups (color guard, wind players , etc.) could easily be the most important part of SOME youngsters educational experience. It offers the potential to be a “No Fail” area in a life filled with adolescent pitfalls and problems. Educators in this area carry a special and unique opportunity to touch youngster’s lives in a dynamic and powerful way. It’s more than just teaching notes; it’s more than just filling up space between touchdowns; it’s more than just dealing with kids who just want an easy “A”. THIS IS ABOUT TEACHING LIFE AND LIFE LESSONS. It’s learning to function in society; it’s about tolerance of others and learning harmony, both musical and personal. It’s laughter, it’s memories, it’s hard work and most of all, it’s the discovery of self worth and self—skills for everyone involved in the process. Never doubt the worth or the importance of even the most humble marching band experience. QUALITY, not quantity, will measure your success. An exceptional experience in music and life. A most distinguished performing arts tradition.